The Daily Show, hosted by Jon Stewart, has become a U.S. institution. It’s a political satire and comedy show that has often crossed over into producing some of the best investigative news journalism on TV. Having previously taken the Bush Administration and many of America’s news networks to task, Stewart has recently made headlines around the world by getting into a dog fight with Jim Cramer, a financial pundit on CNBC. 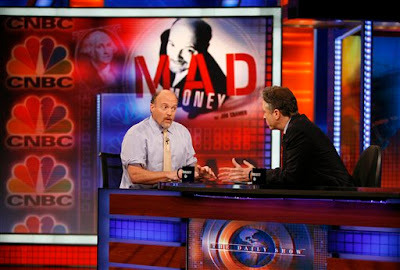 It culminated with Cramer coming onto the Daily Show. This resulted in one of the clearest explanations of some of the back-room financial shenanigans that have contributed to the current world wide financial problems. You can watch the full unedited interview in three segments by clicking here (be on guard if you're offended by swearing). I recommend it, especially on a day when the New York Times headlines the story that failed insurance firm A.I.G. is planning huge bonuses for its executives - even after getting a $170billion bailout from the U.S. Government. Stewart has managed to expose some of what it means when people call for more and better financial regulation - along with much that's wrong with the current banking and finance system.